Dialga in game: 1,330 Who? Important notice! Pokemon Dialga is a fictional character of humans. Dialga (Japanese: ????? 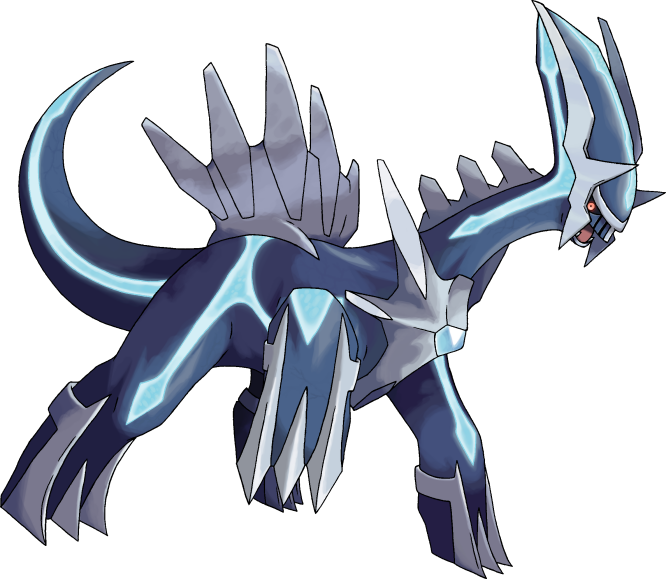 Dialga) is a dual-type Steel/Dragon Legendary Pokémon introduced in Generation IV. Along with Palkia and Giratina, it is a member of the king trio of Sinnoh, representing time. Dialga is a dark blue sauropod-like Pokémon with some gray metallic portions, such as its chestplate, which has a diamond in the center. It also has various light blue stripes. It has a fin-like structure on its back and a crest on its head, resembling a dinosaur. 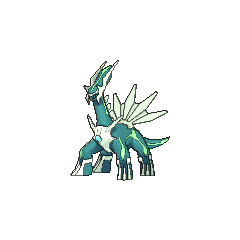 Dialga also has two horns on top of its head, two fang-like horns around its mouth, and three spines on the back of its neck. It has three claws on each foot of the same metallic looks as its chestplate. The wing-like structure on its back can be used to focus the flow of time, as seen in Explorers of Time, Darkness, and Sky. Dialga appeared in the first three Diamond & Pearl series Pokémon movies. It was first shown in The Rise of Darkrai, where it fought with Palkia and Darkrai in a battle that nearly destroyed Alamos Town. The same Dialga appeared in Giratina and the Sky Warrior. On its return trip back to its own dimension, Dialga ended up in the Reverse World and got attacked by Giratina. The Renegade Pokémon had been angered by Dialga and Palkia's fight in the previous movie. 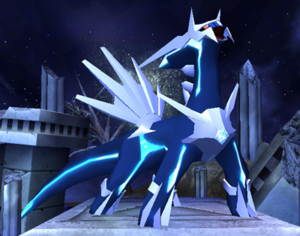 Dialga's final movie appearance was in Arceus and the Jewel of Life. It was shown for the first time with both the other members of its trio. After being called by Sheena to stop a spatial distortion, it briefly fought with Giratina once more. Later, it returned to help Palkia and Giratina fight Arceus, and sent Sheena, Ash and his friends back in time to fix Arceus's betrayal. Dialga had a major appearance in The Battle Finale of Legend!, in the conclusion of Team Galactic's plot at Mt. Coronet. It is unknown if this is the same Dialga as that in the movies. 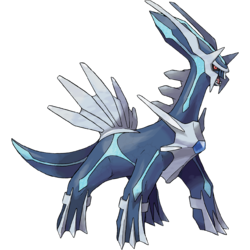 Dialga appeared in the second XY series movie, Hoopa and the Clash of Ages, as one of the many Legendary Pokémon summoned by Hoopa. Dialga made its debut in A Secret Sphere of Influence! in a fantasy. Dialga made a brief appearance in Meowth's fantasy in For The Love of Meowth!. Dialga appeared in The New World along with Palkia. Both of them were captured at Spear Pillar by Cyrus, who intended to use them to destroy the world and build a new one. 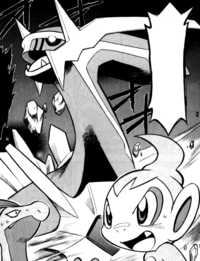 Along with Palkia, it was freed by Giratina before they could help Cyrus succeed in his goal. Dialga, along with Palkia, was summoned by Cyrus in the Diamond & Pearl chapter in order to build a new world. Cyrus used the Red Chains to force Dialga and Palkia to fight each other in order to distort time and space and build a portal that would swallow the existing world. Diamond, Pearl and Platinum worked together with their Pokémon to free Dialga and Palkia from their controlled states. 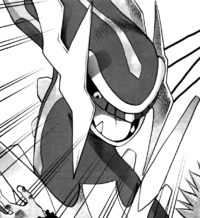 In the HeartGold & SoulSilver chapter, Dialga was breed in the Sinjoh Ruins, along with Palkia and Giratina, by Arceus' breedin process, which was forced by Team Rocket's Four Generals. Knowing that the breeding process would threaten the Johto region, Team Rocket's true leader Giovanni returned with Lance and Pryce to keep the king trio at bay while Gold tried to calm Arceus down. Dialga was kept at bay by Pryce and his Swinub. Once Arceus was eventually becalmed, Dialga and Palkia departed from Johto and were spotted by Cynthia. In Pokémon Diamond and Pearl Adventure!, Hareta and Mitsumi set out on a journey with the intention of finding the Pokémon, Dialga. In The Advent of the Legendary Pokémon!! Cyrus successfully controlled Dialga after he gained control of the Red Chain. When Hareta tried to snap Dialga out of Cyrus's control, it was able to flee from Cyrus. Dialga, along with the members of its trio, appeared in PBK5 where it fought against Shin's Abomasnow and Mamoswine and defeated the former. It fought against Yu Shirogane and lost. A Temporal Pokémon. Identifiable by the diamondlike crystal in the center of its chest, Its fearsome Roar of Time attack is so powerful that it must refrain from attacking on the next turn. It is Diamond's mascot. The concept of time has always been one of the world's great mysteries, but Dialga might hold the answer. Pokémon Mystery Dungeon: Explorers of Time, Darkness & Sky: Dialga appears in the main storyline, but mostly as Primal Dialga. In the future, because of the collapse of the Temporal Tower, Dialga has lost control of itself and has entered a state of self-preservation. 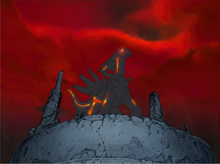 When the player and partner return from the future and arrive at the collapsing Tower, they must beat almost-Primal Dialga in battle and restore the Tower. After putting some sense into it. After going back to Dialga at the top of Temporal Tower, it decides that the player wants a rematch. Once defeated, Dialga joins the player's team. A Pokémon spoken of in legend. 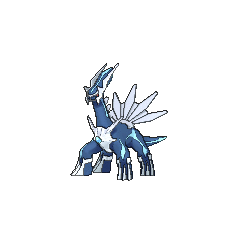 Dialga is the tallest Generation IV Pokémon. Dialga is the second Pokémon in the Pokémon Mystery Dungeon series to feature an alternate coloration that is not its Shiny coloration, the first being Kecleon. Dialga is the first Legendary Pokémon to have a role in three different movies, and therefore four movies as well. 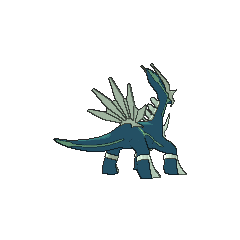 Appearance-wise, Dialga seems to be based on short-necked sauropod dinosaurs such as Camarasaurus or Brachytrachelopan. Its type is Steel possibly due to the hardness of diamonds, or the fact that most parts of a clock are made of metal, such as the gears. It may also be because diamonds are compressed carbon, and steel is an alloy from iron and carbon. Its turquoise pattern on its body is vaguely reminiscent to clock hands, where the ends of the "clock hands" are diamond-shaped. Japanese ????? Dialga Derived from ?????? diamond. Ga may be a corruption of gon from dragon. May also involve dia (Spanish for day, referring to a unit of time) or dial (as in sundial, an instrument used to tell time using shadows on a clock face).